All of Thomas’s Harvard ambition on display in our first meeting didn’t translate into him getting much homework done. He wasn’t the worst student but it certainly didn’t feel like that 200 point gap to a Harvard GMAT score was disappearing in a hurry. Like most of my GMAT tutoring students he had a demanding job and found it very challenging to balance work and GMAT. It’s tough. The GMAT is a hungry beast. I made his GMAT schedule easier but still the work would come in spurts and not in the consistent and organized way that actually translates into epic Harvard GMAT scores. After two months he had improved on paper with scores grazing 700, but still he would occasionally bomb a section. Notice that all of these assignment are done. Harvard GMAT here we come!!! The following days nothing was done. When test day came we were throwing out a prayer. A hail mary as we call it. Was that Harvard GMAT score forthcoming? I thought there was the tiniest chance that if everything was perfect he just might squeak by with a 700. Nope. 570. His Quant had gone from a consistent 46 to a 34 on the real test. It was a disaster. Harvard looked rather far away. We were both disappointed. What had happened? To Thomas the test had been a walk in the park. Easy. His only indication that the test had been difficult was the shocking score. My guess is that he had done a lot of shallow analysis on his GMAT. This type of thinking led him to the sucker answers that tempt many MBA hopefuls from the path to GMAT glory. Why was Thomas guilty of shallow thinking? He really hadn’t prepared consistently to the point where he felt really solid on all of his fundamentals. I was able to teach him GMAT skills but he didn’t have the confidence to dig deeper in order to apply those skills. Here’s an article on building GMAT confidence. The 570 really shook Thomas. He realized that all of my encouraging him to get organized was critical for him to achieve his amazing GMAT score. Luckily, Thomas still had plenty of Harvard level ambition. Mostly because he had spoken with a Harvard admissions officer who had made it very clear that regardless of how great his resume was that without a 700+ GMAT score his chances of admission to those hallowed halls were rather slim. Also working for us was a mutual trust. He had not achieved even close to the score that he was after but I believed that he could do it and he felt confident that I could help him get there. At this point Thomas had been working on his GMAT for about 8 months. Long term GMAT preparation is tricky. Not only is it mentally exhausting but you can run out of GMAT practice materials. Staying organized helps with the mental exhaustion. Make a GMAT study plan. Compartmentalize your studying. Plan time off from studying to rest your brain. There is an ocean of non-official GMAT materials most of which I wouldn’t touch with a ten foot pole. There are some things that I can recommend. For extra Quant practice I can endorse the GMAT Club Quant CATs. The only problem is that these tests are so tough that you can only really use them if you are already scoring well (around a Q45). Considering how challenging these tests are, before you approach them, it might helpful to read this article on reviewing impossible GMAT questions. I would avoid third party verbal questions. It is really tough to write verbal questions that are of the same quality and flavor as GMAT questions. Official LSAT questions provide an excellent alternative. They are similar to GMAT questions except that LSAT questions are generally tougher. There are literally thousands of LSAT Logical Reasoning and Reading Comprehension Questions. To Thomas’s chagrin I assigned a host of them. Thomas was invigorated as he saw the finish line (and the last piece of the puzzle for his Harvard application) 40 points away. Although, between us: those 40 points between 660 and 700 are elusive. Regardless of the challenges ahead it was encouraging to see the forward momentum that begets Harvard GMAT scores. Seeing my students succeed is a big part of why I teach. During the last 10 days Thomas buckled down and made a strong, no holds barred, in it to win it push, especially in the verbal. He took that time off from work and spent those last days solely focusing on his GMAT studies so that he could really give this last GMAT a “Harvard try”. Harvard GMAT score here we come! We also had a gift from GMAC: Exam Pack 1. 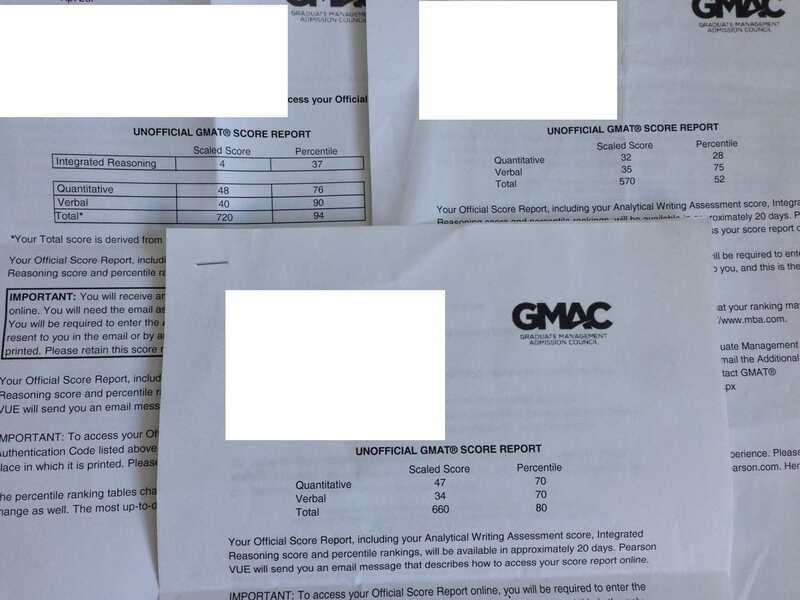 With GMAT Prep Tests 3 and 4 we were able to get some real data points. Thomas was nervous about taking a “real” exam. When you’ve put a bunch of work in it can be nerve racking to anticipate whether those hundreds of hours have actually paid off. Exam Pack 3: 700. After taking Exam pack 3 Thomas said “getting a 700 is really hard”. He now understood the amount of focus and dedication that he needed. Exam Pack 4: 710.